Dottie Boscamp gathers, blows, shapes, and colors the molten glass to create these artful dispensers. 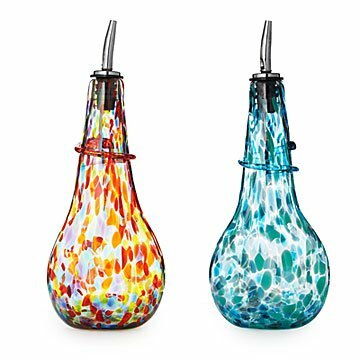 Healthy eating just got a lot more beautiful with these artful glass oil dispensers. Dottie Boscamp creates each one through the magic of Old World craftsmanship: she gathers, blows, shapes, and colors the temperamental molten glass, all while keeping it at just the right temperature and consistency, before letting it slowly cool. The removable pour spout makes it easy to fill the bottle with your favorite olive oil or infused oil. Keep it in the kitchen to brighten up dinner preparations, or bring it to the table for your next dinner party. Handmade in Laporte, Colorado. Visit our blog to see Dottie in action and learn more about how she became an artist. “Blowing glass is like a dance, always moving and responding to my partner, which is the molten glass,” explains artist Dottie Boscamp. From the moment Boscamp gathered the 2000 degree liquid glass from the furnace, she has enjoyed the creative process of making art. It all started back in college at Illinois State University in the year 2000. The heat and fire amazed her and 17 years later, she is still amazed and shares her passion with other students when she teaches classes in her studio in Laporte, Colorado. I use one for olive oil and one for balsamic vinegar - - they make the countertop pop with such pretty colors! Based on the pictures online, I thought these would be round bulbs, but in reality they are dimpled and more like rounded squares. The dimples do make them easier to hold, but I don't think they look as nice as if they were completely round around the sides. It's still a nice dispenser, just not how I thought it would look. I am now eyeing this lovely piece of glass work for myself. Looks so pretty left on the counter.